Easter is right around the corner, and holidays are such a great time for giveaways that I can’t resist doing one with an Easter theme to it. 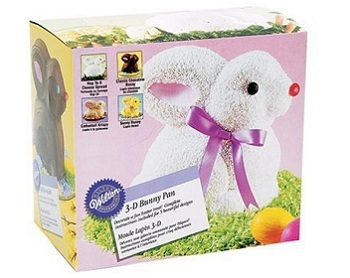 I’m giving away Wilton’s 3D Bunny Cake Pan and a set of oh-so-cute jellybean potholders. To win, simply leave a comment that mentions your favorite Easter dish (or other spring holiday dish if you don’t celebrate Easter) below! A winner will be selected randomly from the comments below and entries will close at 12 noon (PST) on Friday, March 26th. This leaves plenty of time for the pan to arrive before Easter so you can use it next weekend! Be sure to leave your e-mail address in the comment form (not in your comment) so that I can contact the winner for a mailing address. There is a little bit of small print with this prize and that is the fact that this pan is not brand new and has been used by me a few times to test it out and bake up an Easter bunny cake. A post about the bunny cake will be coming up in the next day or two and you can double your chances of winning by looking out for that post and commenting on it, too. The cake pan will be all cleaned up and back in it’s box for mailing, ready to use when it arrives at your door. And as for my favorite Easter dish? It’s hard to choose just one thing, but if pressed I’d have to say that deviled eggs are near the top of the list, followed by Peeps Cupcakes, which are a current favorite. Peep S’mores are very tasty, too, but I’d be hard pressed to call them an actual dish! Update: The contest is now closed! Thanks for playing everyone. I can’t wait for Easter with all these great food ideas! I love Mardi Gras king cake! I know this is lame, but its got to be salad. Finally, veggies are looking good and lettuces are in season and man, it feels good to jump into spring with a good tossed salad. Deviled eggs are my favorite Easter food, no contest. I love making them and I love eating them. A guest unexpectedly brought some to Thanksgiving dinner last year and I was way too excited about it! deviled eggs are my spring/summer fav. i would rather have one than any potato or macaroni salad. love them! Asparagus is my favorite easter dish – it’s the most perfect springtime food, and after months and months of winter spring is VERY welcome! I have to confess my favorite Easter-ANYTHING is a guilty pleasure of mine, original Cadbury eggs. I don’t know why they’re so good, but I have to limit myself to one per year or I will go nuts! What a great Easter giveaway! My mom always made an egg/bread/sausage casserole on Easter morning. The recipe was handed down from my grandmother. It was a very simple dish but we always looked forward to it and it’s still an Easter tradition in our family. We always have potato salad with whatever entre is served on Easter. I love the transition from hot potato dishes at the fall/winter holidays to this cold side dish. Potato salad always makes me think of spring and Easter and I love it! Peanut butter eggs bring back great childhood memories, so they’re right up there for me. But what I really look forward to is a good Easter ham! Emeril has a great recipe for ham with a cherry glaze – YUM! For myself, my favorite dish is just plain peeps. I would live off the stuff if I wouldn’t get sick from all the sugar. Ricotta pie with wheatberries and orange flower water! Easter is the only time I ever go to the trouble of making it, but it’s so amazing. I would love that cake pan! My favorite thing at Easter is my granny’s potato salad! Pork loin stuffed with pears, figs and gorgonzola! Made it last year for Easter and it was so good we’re having it again this year. Oh I would love that pan! My favorite dish is potato salad and ham! My favorite Easter dish (besides Easter candy!) is au gratin potatoes – we only have them on Easter and Christmas, and there’s something about the spring air that goes so well with them! I love deviled eggs and carrot cake cupcakes! I always look forward to the ham and then to the leftovers! We grew up with a similar cake pan in our house. It’s a cast iron pan in the shape of a lamb. My mom always had a hard time getting it to stand up. So she made a sheet cake base for it and used quite a few toothpicks to prop it up. My sister now has the pan and keeps up the tradition. The head has always been the prized piece. So, I’d have to call lamb cake my favorite Easter treat. Deviled eggs are an Easter tradition in our family. I love Crescia. It’s a traditional Italian peppery cheese loaf that you’re supposed to bake on Good Friday when you’re not allowed to leave the house from noon to 3 because Christ is dying on the cross. My grandma is a devout Italian Catholic and makes the best crescia. Her’s is with Locatelli which I think is preferable to the tradition parmesean cheese. I can’t wait for it. My favorite is deviled eggs, too. And scalloped potatoes. Deviled eggs. I don’t normally eat hard boiled eggs (not the yolk at least) but there’s just something about a deviled egg that I can’t resist! My favorite Easter dish is egg sandwiches. I love the foods served at the Seder dinners my friends host…this past year the Matzoh ball soup was especially delicious. My Easter fav has to be the lamb-mold lemon pound cake…but this bunny cake could replace it! My favorite spring holiday food would have to be charoset – a Passover dish made with apples, honey, nuts, cinnamon and sweet wine. I pretty much take the container out of the fridge and not get it any farther than the utensil drawer after grabbing a spoon before I dig in! I always make a grilled leg of lamb either for Easter, Pascha or any of the spring birthdays in my family. I love the egg salad that comes from all the died Easter eggs! I love orange jello mold with carrots and pineapple. I also love deviled eggs! Foodwise I have to say a leg of lamb… and (though not for the same meal) homecured salmon… nomnom. Sweets wise I have nothing that tends to always appear at easter, pick and mix sweets, mini eggs.. all there but baking wise my first choice would be a sponge/merignue base (baked together) in two layers filled with whipped cream and fresh berries, possibly cream flavoured with lemon curd. i like ham – we don’t have it very often – also my family serves it with a sweet warm mustard sauce that is AWESOME. Yum!!! Deviled eggs!!! We always have my aunts bbq pork shoulder brought up north from their bbq shop in KY…super YUM! Whatever jello salad my mom decides to make 🙂 She has three that she rotates through and they are all so yummy!